How do you even lift your arms like that with a torn rotator cuff? After the Eagles and Patriots exchanged field goals on their opening drives, Nick Foles and the Birds offense wasted no time in scoring the game's first touchdown and regaining the lead. First, Foles his Nelson Agholor for seven yards. Next, LeGarrette Blount broke of a 36-yard run. 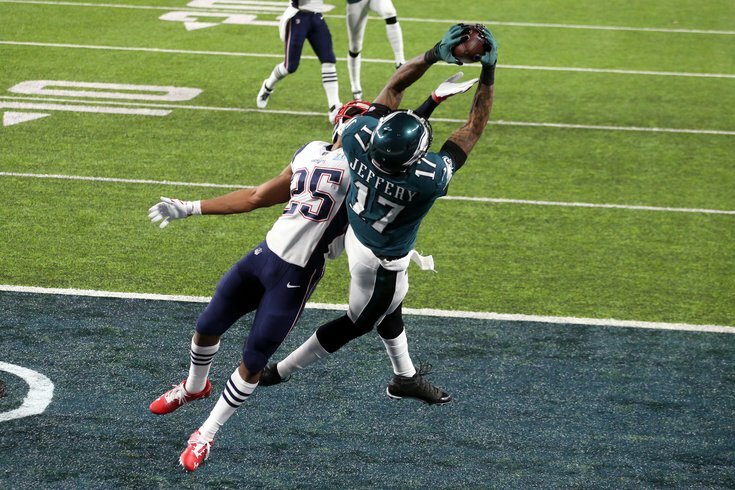 Then, it was Foles to wideout Alshon Jeffery for the longest touchdown in Eagles Super Bowl history, a 34-yard deep ball that featured an absolutely ridiculous grab by Jeffery. Let's have a closer look at that. I mean, that's one hell of a catch. The Eagles had to settle for a 9-3 lead, however, after Jake Elliott missed the extra point.